Solomon is a self-service intelligence platform for business improvement districts (BID) of all sizes. It is a cloud-based solution designed to tackle the diverse challenges BIDs have to face. This web software runs on mobiles, tablets and computers of any size and incorporates a range of tools that enable place management teams to organise, visualise and extract value from data, in real-time. Businesses can login to Solomon too, giving them immediate access to an itemised breakdown of what is being done to benefit each of their hereditaments, as well as providing a portal to local information. Solomon is developed in partnership with LeedsBID and the british company Hebe Works. It integrates with National Non-Domestic Rate data providing a pain-free way to ensure data is always in sync with local authority records. The software plays nicely with third-party websites and data sources making it easy to consolidate knowledge into a single, easy to access portal. No more wading through spreadsheets to ensure your data is up-to-date and in sync with the National Non-domestic Rates record. Solomon makes it easy for your whole team to manage and maintain data about hereditaments, businesses and people. If a business moves, built in logic ensures you can link their historical data. A comprehensive CRM tool allows you to build deeper relationships with businesses in your District. You can formulate a clear picture of who is who, including details of local contacts, voter, bill payer and other people. Store a detailed history of your relationship with each hereditament by tracking interactions and jobs. Use integrated reporting tools to analyse your data and build a detailed picture of the size and makeup of your district. Charts, heat maps, RAG indicators and more, combined with user defined tags and groups, make it easy for you to understand your BID at a glance. Engage with your levy payers and provide them with on-demand access to local information via user friendly dashboards. 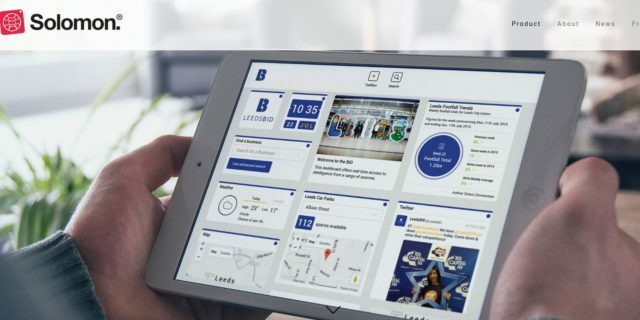 Itemised Bills give businesses a play-by-play account of what the BID is doing to benefit each of their hereditaments and our live chat facility helps businesses get more out of the BID. Solomon can plugin to almost any source of data on the web, enabling BIDs to consolidate knowledge from various systems. Footfall, car parks, crime, transport, weather data and more can be used to make your BID even smarter. In addition to live chat and the online knowledge base, a dedicated team of developers are at work everyday to make Solomon even better. They regularly release new features and improvements, which are free to all customers. Their mission is to make Solomon the ultimate intelligence solution for BIDs of all sizes.